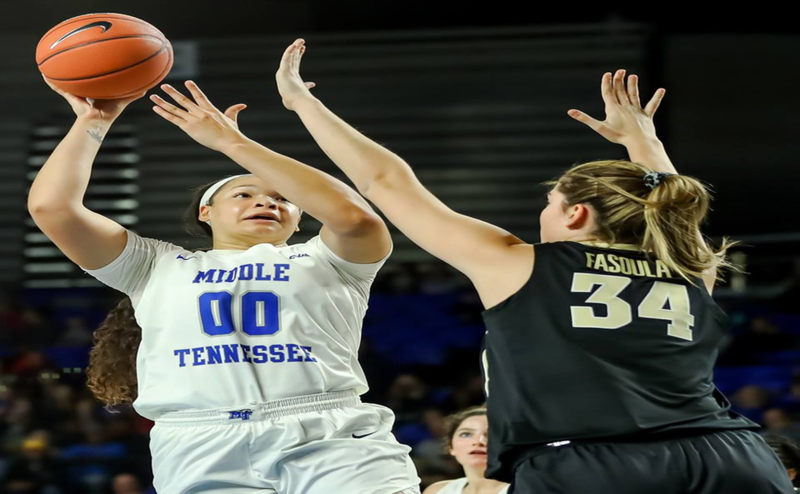 The Middle Tennessee Blue Raiders took advantage of the Vanderbilt Commodores, who were in foul trouble, and won 65-58 in their first regular season home game Friday. 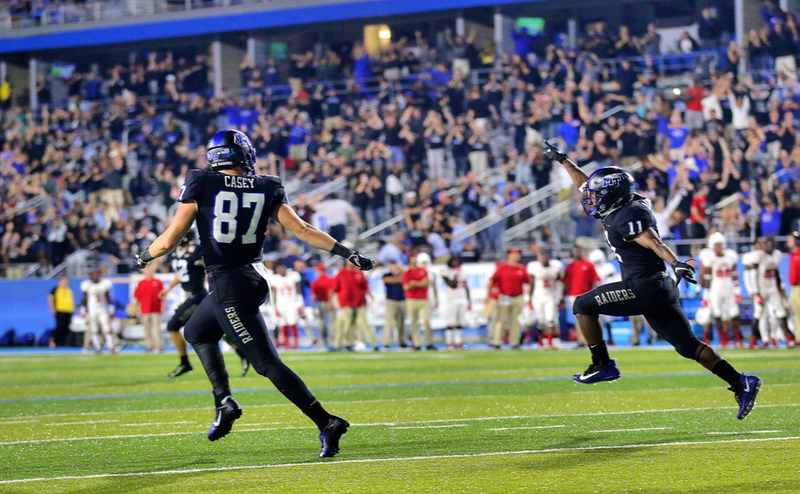 This is the second year in a row that the Blue Raiders have defeated the Commodores. The mighty Blue Raiders were up from the start of the first quarter and went up 23-7. 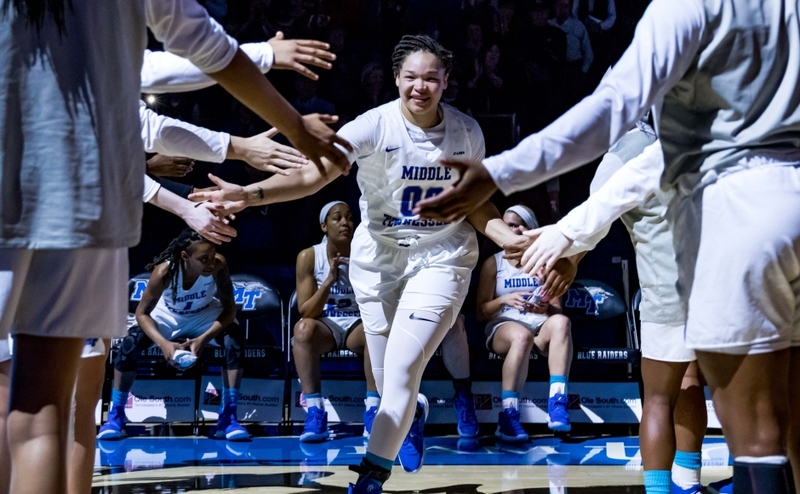 MTSU was 66.7 percent (8-12) from the field, 60 percent (3-5) from three-point land and 66.7 percent (4-6) from the free-throw line. The second quarter was looking good for MTSU, but Vandy made their first field goal after 14 minutes and went on a run. Vandy scored 11 straight points in the last five minutes of the half. In the second half, the Blue Raiders got outscored 31-37 but still managed to get the win. Senior transfer guard A’Queen Hayes had a season high and career high with 17 points, 11 of those coming in the second half. Senior forward Alex Johnson led the Blue Raiders with 19 points, six rebounds, two steals and one block. Sophomore guard Anna Jones had 13 points while going 4-6 from the field and perfect from three. Jones also had six rebounds and two blocks. They only allowed the Commodores to score a combined 21 points in the first half. At one point they didn’t allow them to make a field goal for 14 minutes. MTSU forced the Commodores into foul trouble early with their bigs each having two or three fouls. The Blue Raiders also caused the Commodores to shoot terrible shots, shooting only 16.7 percent (1-6) from three and 26.9 percent from the field (7-26). The Blue Raiders had a total of 23 turnovers, and 13 of those were in the second half. Vandy also went on a 17-7 run from five minutes left in the third quarter to three and a half minutes in the fourth to have the lead cut down to six points. 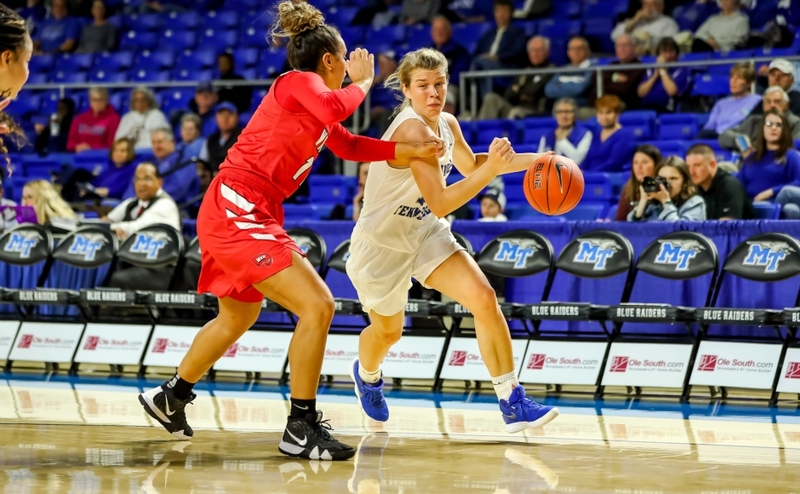 The Lady Raiders were able to hold off the Commodores comeback attempt and secure their first victory of the season against an SEC opponent and cross-town foe. 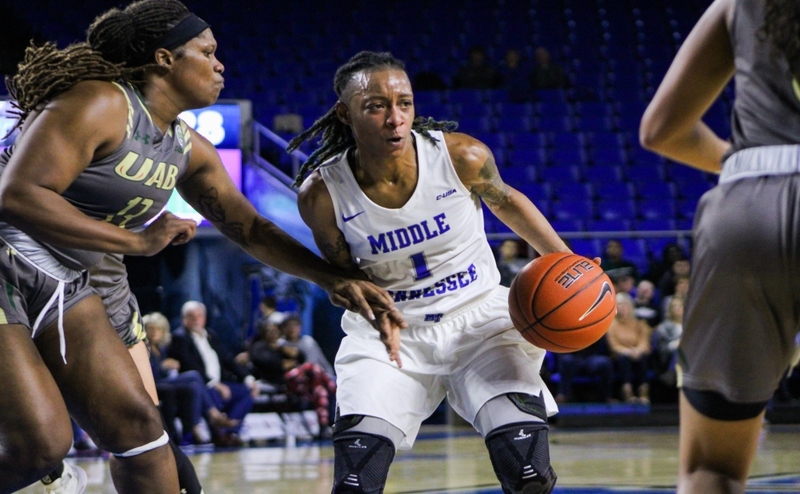 The Middle Tennessee State women’s basketball team brought home a win off the road against Furman University on Sunday. The Lady Raiders had a major comeback, winning the game 78-71 as they trailed in the third quarter by 12, 57-45, with 4:09 remaining. Middle Tennessee went on a scoring run of 23 points in the last 14 minutes of the game. A major key player in the game was sophomore Anna Jones, who scored 13 points and had five rebounds. Freshman Taylor Sutton also contributed 18 points, shooting 6-6 from the three-point range to put the Lady Raiders in double figures over the Paladins. 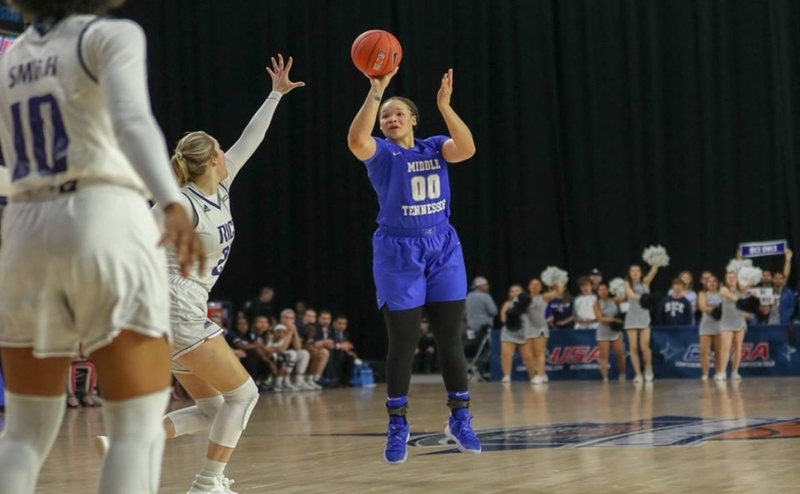 Being her first year on the team, A’Queen Hayes had 13 points and four rebounds, while Alex Johnson added 12 points including 10 clutch points in the second half. Jess Louro scored 10 points just after Hayes scored a big-time basket with three minutes remaining to push the lead to five. The Lady Raiders were 10-of-10 from the free throw line in the fourth quarter and 8-of-8 in the last 23 seconds of the game. Overall, the Blue Raiders were 12-of-13 from the line throughout the game. They also did a great job shooting from behind the 3-point arc. They connected on 39 percent of their 3-pointers and shot for 50 percent from the field. The Lady Raiders will be back in action this Friday night as they take on the Tennessee Tech Eagles in Cookeville, Tennessee.